Like a smoker who keeps trying to quit but sneaks a drag when he thinks nobody’s looking, China is slowly weaning itself off coal. Last winter, the Chinese government released preliminary statistics showing that its coal consumption had dropped 2.9 percent in 2014. But that number may be obfuscating the truth about China’s coal use—and about how quickly its carbon emissions are declining. A study published this week in Nature Climate Change takes a close look at what China’s “historic” 2014 reduction in coal consumption actually meant. 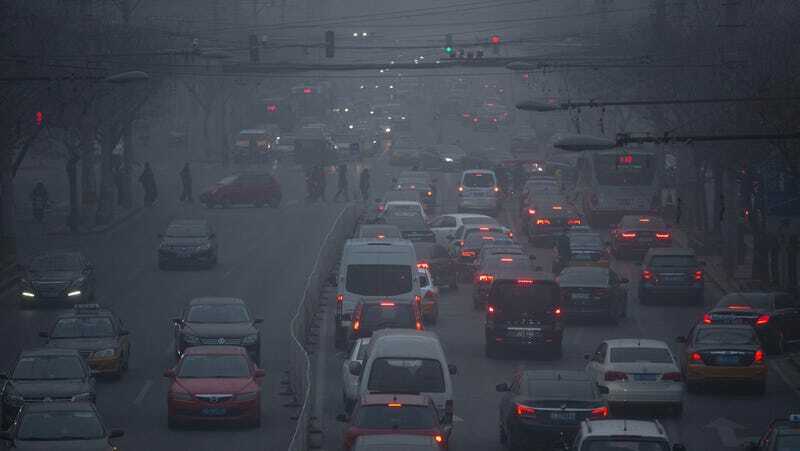 When the Chinese National Bureau of Statistics reported that 2.9 percent figure, the International Energy Agency used it to estimate that China’s overall carbon emissions had fallen by 1.5 percent. Because China accounts for nearly a third of all carbon emissions worldwide, this drove humanity’s collective carbon footprint down by 0.2 percent. Progress! Well, not exactly. As Jan Ivar Korsbakken, a senior climate economics researcher at CICERO points out, a reduction in the amount of coal a country consumes by weight doesn’t necessarily translate into lower emissions. That’s because you have to account for the energy content of the coal, too—some coal is more carbon-rich than other coal. In the case of China, coal consumption fell by 2.9 percent in 2014, but the overall energy density went up. It’s like trying to lose weight by cutting your overall food intake, but in the process, trading fruits and veggies for cheese and chocolate. When Korsbakken and his co-authors took this detail into account, they found that China’s carbon emissions actually increased in 2014, by 0.8 percent. China does not have a great track record when it comes to reporting energy use: Its statistics are routinely revised, and often contain tremendous gaping holes. But given the country’s outsized influence on global carbon emissions, those statistics matter a lot. For instance, it came to light last fall that China was burning up to 17 percent more coal than the government had previously claimed, an amount that equated to 70 percent of the United States’ total annual coal consumption. China isn’t winning any climate prizes with an error margin of 20 percent. On a brighter note, it seems that China’s overall coal usage really is falling. The country reported even steeper coal reductions—3.7 percent—in 2015, which, Korsbakken and his colleagues conclude, “makes it likely that the stagnation in coal use in 2014 was real and the start of at least a short-term trend.” At the same time, China continues to make major investments in wind and solar technology. The question is whether China can decarbonize fast enough to live up to the ambitious climate pledge it made in Paris last December. And whether the rest of us can believe it if we read it.